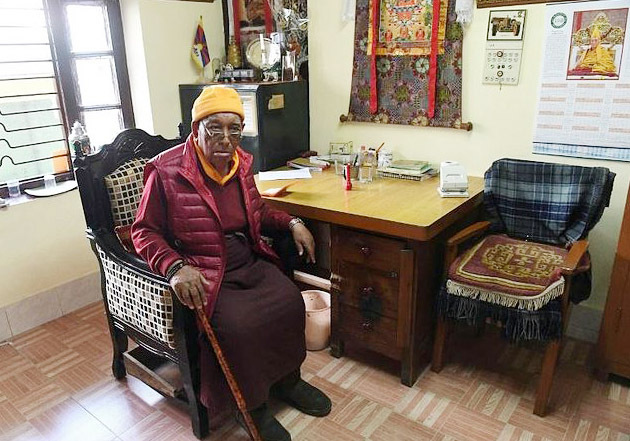 (TibetanReview.net, Jan27, 2018) – Dr Yeshi Dhonden, a nonagenarian doctor of traditional Tibetan Medicine, known as the Sowa Rigpa, has been selected by the government of India to be among the 72 people to be honoured with the Padma Shri, the country’s fourth highest civilian award, on its 69th Republic Day of Jan 26. India recently gave legal recognition to this system of medicine and also filed a World Heritage status recognition for it with the UNESCO. Dr Yeshi Dhonden, a monk, has been the personal physician of the Dalai Lama from 1960 to 1980. He was also the head of the Tibetan Medical and Astrological Institute (TMAI), an autonomous educational and healthcare centre in the field of Sowa Rigpa under the Central Tibetan Administration, from its start in 1961 until 1979. Dr Yeshi Dhonden is a highly sought after doctor especially for all sorts of chronic ailments and cancer, with patients coming from all over India and abroad. He has also collaborated in research projects with the University of Virginia in the 1970s and with cancer researchers in universities in California in the 1990s. He has authored the books titled Health Through Balance: An Introduction to Tibetan Medicine and Healing from the Source: The Science and Lore of Tibetan Medicine. “People come here in routine to meet him. I bet if three flights are coming to Dharamshala, then half of these are booked with his patients or people who want to seek an appointment,” timesofindia.com Jan 26 quoted Ashwani Bamba, president of McLeodganj Hoteliers’ Association, as saying. People earlier used to queue up right from 3 am to get an appointment token, Deepak Deewan, who owns a travel agency in McLeodganj, has recalled. In his old age, Dr Yeshi Dhonden now sees only a limited number of patients each day, with appointments being required to be booked well in advance. He is the second Tibetan to receive this honour, after Geshe Ngawang Samten, the vice chancellor of the Central University of Tibetan Studies in Sarnath, who received it in 2009. The Padma Awards – including the higher ones of Bharat Ratna, Padma Vibhushan and Padma Bhushan – were instituted in 1954 to honour citizens of India in recognition of their distinguished contribution in various spheres of activity including the Arts, Education, Industry, Literature, Science, Sports, Medicine, Social Service and Public Affairs. It is also awarded to distinguished individuals who are not citizens of India but have contributed in various ways to India. Dr Yeshi Dhonden is not listed as a foreigner in the award list.